In Java’s earlier version, It uses FileSystem conventional API to access system file. 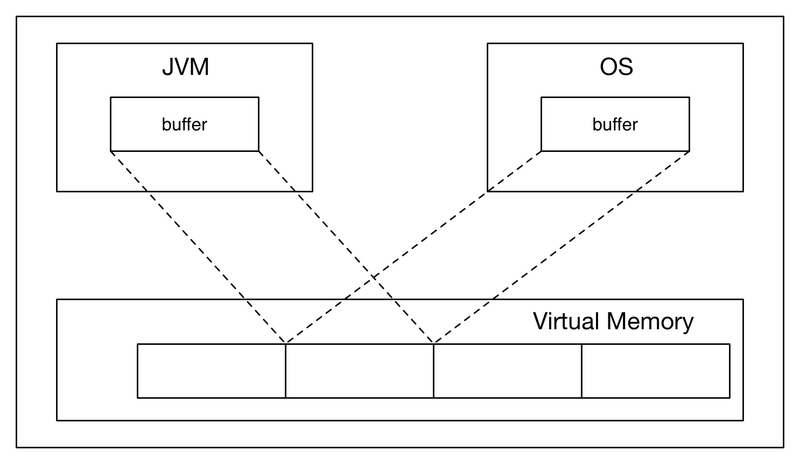 Behind the scene JVM makes read () and write () system call to transfer data from OS kernel to JVM. JVM utilize it memory space to load and process file that causes trouble on large data file processes. File page convert to JVM system before processing the file data because OS handle file in page but JVM uses byte stream that is not compatible with page. In JDK version 1.4 and above Java provides MappedByteBuffer which help to establish a virtual memory mapping from JVM space to filesystem pages. This removes the overhead of transferring and coping the file’s content from OS kernel space to JVM space. OS uses Virtual Memory to cache the file in outside of Kernel space that could be sharable with other non-kernel process. Java maps the File pages to MappedByteBuffer directly and process these file without loading into JVM. Belo diagram show how JVM mapped the file with MappedByteBuffer and process the file without loading the file in JVM. MappedByteBuffer directly map with open file in Virtual Memory by using map method in FileChannel. The MappedByteBuffer object work like buffer but its data stored in a file on Virtual Memory. The get() method on MappedByteBuffer fetch the data from file which will represent current file data stored inside disk. In similar way put () method update the content directly on disk and modified content will be visible to other readers of the file. Processing file through MappedByteBuffer has big advantage because it doesn’t make any system call to read/write on file that improve the latency. Apart from that File in Virtual Memory cache the memory pages that will directly access by MappedByteBuffer and doesn’t consumes JVM space. The only drawback is the it throw page fault if requested page is not in Memory. The JVM directly process on Virtual Memory hence it will avoid system read () and write() call. JVM doesn’t load file in its memory besides it uses Virtual Memory that bring the ability to process large data in efficient manner. It could be used more than one process based on locking provided by OS. We will be discussing locking in later. This also provides ability map a region or part of file. The file data always mapped with disk file data without using buffer transfer. Note: JVM invokes the shared VM, page fault generated that push the file data from OS to shared memory. The other benefit of memory mapping is that operating system automatically manages VM space. PRIVATE: Change in MappedByteBuffer will not reflect to File. MappedByteBuffer will also not be visible to other programs that have mapped the same file; instead, they will cause private copies of the modified portions of the buffer to be created. Map()method will throw NonWritableChannelException if it try to write on MapMode.READ_WRITE mode. NonReadableChannelException will be thrown if you request read on channel not open on read mode.